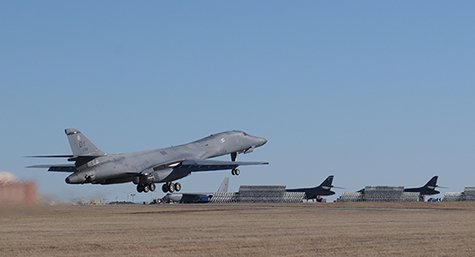 OKLAHOMA CITY, Jan. 22, 2014 – The U.S. Air Force on Jan. 21 received the first B-1 bomber upgraded with the Boeing [NYSE: BA] Integrated Battle Station. In this photo, the B-1 takes off from Tinker Air Force Base, Okla., where Air Force maintenance technicians installed the upgrade. It was delivered to Dyess Air Force Base, Texas. OKLAHOMA CITY, Jan. 22, 2014 – The U.S. Air Force on Jan. 21 received the first B-1 bomber upgraded with the Boeing [NYSE: BA] Integrated Battle Station, which essentially turns the B-1 into a new aircraft with the addition of full color displays, moving maps and a new diagnostics system. The upgrade, the most extensive modification program in B-1 history, enhances the bomber by giving crews greater situational awareness of what is happening in the battlespace around them, in addition to faster and more secure communication capabilities that improve crews’ ability to engage enemy targets. In this photo, the B-1 takes off from Tinker Air Force Base, Okla., where Air Force maintenance technicians installed the upgrade. It was delivered to Dyess Air Force Base, Texas.